I've never been one to wear leopard or zebra print clothes, they're too flashy for me and not something I gravitate to. But I've seen so many animal print dresses lately that I'm totally swooning over! The ones that I like have teeny tiny animal shapes, and I picked out a few of my faves to share with you! What do you think of this trend? Are there any animal print dresses you're loving lately? I'm in the same boat with you! Not so crazy about animal print, but those dresses are adorable and designed to a way that I would actually wear them. Large zebra, cheetah, and leopard prints? No thanks. Tiny animal prints on beautifully cut dresses? Yes please. Great selections! I'm sure hoping this trend isn't going away anytime soon! Dress number four is too cute! 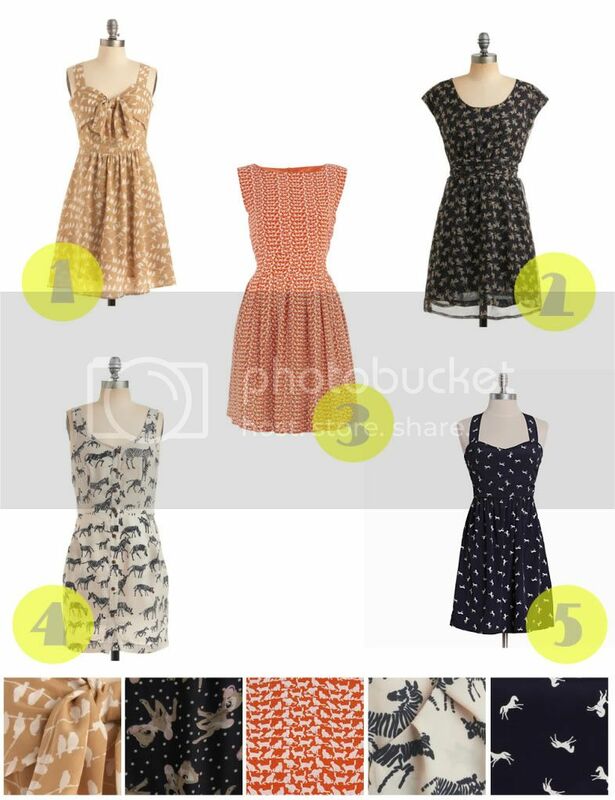 Modcloth always has such cute things, it makes me wish I had tons of money so I could just get everything! Super cute, I love them all. I think animal prints are so cute. I have one from Modcloth that has little foxes and I love it. i love animal prints - these are such gorgeous picks!! these are all very very cute! Super cute, I love the NO1!